There are far more ways to repot cymbidiums than there are to skin the proverbial cat. What’s more, the orchids usually survive the operation, unlike the cat! My method will certainly not meet with universal approval, but it works well in the sense that it provides enough acceptable flowering plants for my display at show time. Potting-on, Repotting and Division. Potting-on means removing an orchid together with its potting mix from the pot, transferring them to a larger pot and then filling the remaining space with fresh mix. This operation involves minimal disturbance of the orchid, and it may therefore be carried out at any time of the year. However I do not recommend potting-on if the original mix is older than 18 months, unless it is planned to repot within the next year. If repotting is left longer, the older mix at the centre of the pot will begin to ‘break down’, leading to a mass of rotten roots which gradually spreads outwards. Repotting means removing all the old mix from the orchid’s roots and replacing it with fresh mix. At the same time it is advisable to remove most or all of any leafless backbulbs present. These backbulbs carry the oldest roots of the plant, and their removal therefore minimises a likely source of rot. If the plant has a clump of backbulbs in its centre, it will probably need to be divided into two or more pieces. Actually, it may fall apart when the backbulbs are removed. If not, it will be necessary to cut the rhizome connecting the growths with a sterile carving knife, or to tear the bits apart using brute strength. I prefer the latter technique, as the carving knife is never the same after it has been sterilised in the gas flame a few times. Neither are my hands, so I settle for a good wash with soap and hot water. Hygiene. The main reason for sterilising orchid tools is to reduce the possibility of transferring virus from one plant to another. This transfer takes place via plant sap; if the first plant repotted is infected with virus, it’s possible to transfer that virus to all plants subsequently handled. The best strategy to avoid this possibility is to handle each plant as if it has a virus infection. Sterilise all tools and wash your hands thoroughly after each plant is repotted. Never use old mix from one plant to repot another, and if you re-use old pots make sure that they have been thoroughly cleaned and sterilised. Some growers use a potting bench covered with multiple layers of newspaper. After each plant is repotted they wrap any fallen mix (both old and new), root fragments and plant debris in the topmost layers of paper and discard them. When to Repot. Experience has taught me that I should repot every second year rather than every third, because after three years the roots are so tightly packed that I cannot remove the plant without a struggle and sometimes it’s necessary to cut the pot open to remove the plant. Also, most bark-based potting mixes remain in satisfactory condition for two years but not for three. 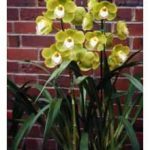 They begin to degrade to finer material in the third year, thus restricting the free drainage that cymbidiums and most other orchids require for healthy roots. 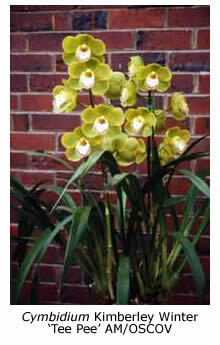 Traditionally, cymbidiums are repotted in late spring, after the flowering season is over. I prefer to stick with tradition and repot those plants that need it in October. It’s best to wait until the likelihood of cold weather is over, because cold, wet weather puts undesirable stress on a newly repotted plant, unless it can be given a dry, comfortable spot. In recent years some cymbidium growers have taken to repotting their plants in March. They claim that their plants are growing at their fastest then, and that they are therefore best able to withstand the shock of repotting at that time. Also, they believe that the flowering spikes are already developing and that therefore repotting cannot interrupt the flowering process, whereas it may do so in late spring when many flower spikes are on the verge of initiation. Professional cymbidium growers repot throughout the year (except for mid-winter), but only because they have too many plants to repot at the optimal times, which are October/November and March. What Potting Mix? Various materials have been used in orchid potting mixes over the years. Victorian growers once used osmunda fibre and tan bark, but red gum chips and pine bark, with or without additives are now in favour. Most growers use pine bark that has been freed of natural plant toxins and aged to make it more water-absorbent (Debco and Propine are major suppliers). Some growers use fine grade bark (5-10 mm diameter pieces), especially for small plants, whereas others prefer the coarser grades (10- 20 mm). mix, that encourages the growth of beneficial mycorrhizal fungi and also releases a steady stream of nutrients for the orchid. I also top-dress the pots with Hoof-and-Horn® and Nutricote® fertilisers in October and March, but seldom bother with liquid fertilisers. New growers: Please do not get the idea that it is necessary to use such a complex mix to get good results. Many growers get better results than I do with a simple all-bark potting mix, although they probably go to more trouble with regard to the choice and frequency of application of liquid fertilisers. How to Repot. I find it easier to remove the plant from its pot and the old potting mix from the roots if the plant is neither freshly watered nor bone-dry. To untangle the roots it is easier to begin at the bottom and work upwards. Sometimes, especially if the plant has not been repotted for many years, the roots defy disentanglement and one must resort to cutting two inches off the bottom of the root ball with a carving knife! Having untangled the roots and removed the old potting mix, I then remove any backbulbs and divide the plant if necessary, as described above. I divide most plants that will not fit comfortably in a 250 mmpot allowing some room for growth. Plants in 300 mm pots are too heavy to transport and repot, and are more suited to sumo wrestlers! Finally I remove any old roots (which are soft or dark brown) using sterile scissors or my hands. When repotting, I first place a layer of potting mix an inch deep in the new pot, to prevent any roots protruding through the drainage holes. With one hand I hold the plant by its leaves in position and with the other I fill the pot with fresh mix. Some growers position the plant so that its bulbs are just above the final level of the mix, but following Julian Coker’s advice I now bury the bottom quarter of the pseudobulbs. Shake the pot to work the particles of mix down so that they fill all gaps between the roots. Finally I top-dress the pot with Hoof-and-Horn® and Nutricote® fertilisers (about two teaspoons of each to a 200mm pot) and shake the pot so that they enter the mix. The last step is to move the pot to a shady, sheltered location and to water it. Coddle the plant for a few weeks before moving it back to its usual sunnier location.